She was black and a woman and a prosecutor, a graduate of Smith College and the granddaughter of slaves, as dazzlingly unlikely a combination as one could imagine in New York of the 1930s ― and without the strategy she devised, Lucky Luciano, the most powerful Mafia boss in history, would never have been convicted. When special prosecutor Thomas E. Dewey selected twenty lawyers to help him clean up the city’s underworld, she was the only member of his team who was not a white male. 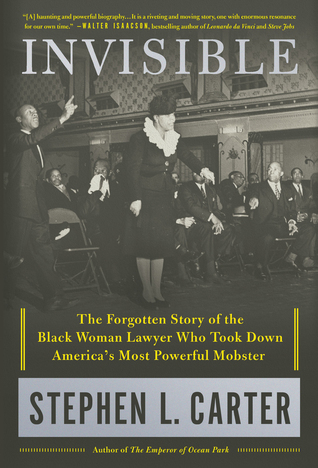 Eunice Hunton Carter, Stephen Carter’s grandmother, was raised in a world of stultifying expectations about race and gender, yet by the 1940s, her professional and political successes had made her one of the most famous black women in America. But her triumphs were shadowed by prejudice and tragedy. Greatly complicating her rise was her difficult relationship with her younger brother, Alphaeus, an avowed Communist who ― together with his friend Dashiell Hammett ― would go to prison during the McCarthy era. Yet she remained unbowed. Moving, haunting, and as fast-paced as a novel, Invisible tells the true story of a woman who often found her path blocked by the social and political expectations of her time. But Eunice Carter never accepted defeat, and thanks to her grandson’s remarkable book, her long forgotten story is once again visible.